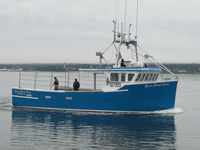 Crab: F/V Chief Stephen J. Gloade Sr.
02 Crab: F/V Chief Stephen J. Gloade Sr.
06 Crab: F/V Cindy H.
The d'Eon name has been synonymous with quality fishing vessels through three generations. Today, with Maurice d'Eon and business partner Michel Surette at the helm, the care and workmanship put into each custom vessel constructed at d'Eon Boatbuilding Limited is still unsurpassed. 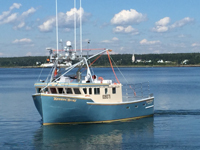 We construct all types of fishing vessels - lobster, longline, scallop, crab, dragger, semi-planing - as well as pleasure boats. Our boat bays have the ability to accommodate hulls up to 65'. In addition to vessel construction, our welding shop can fabricate your metal needs. Quality vessels speak for themselves. Browse through our selection of custom boats at your leisure, then give Michel Surette a call. He'll be happy to draw up a quotation based upon your requirements. We are located in the heart of the ever-expanding fishing community of West Pubnico, where the wharves are home to many of our custom boats.